Detective Inspector Will Jackman is back again in this thrilling release from Jane Isaac. Isaac’s third novel to come out with Legend Press, and the second in the Will Jackman series, Beneath the Ashes is another pacy page-turner filled with twists and turns. The story opens when DI Will Jackman is called to investigate a burned-out barn in Warwickshire countryside, where an unidentified man lays charred and burned. Who is he and why was he placed in the barn after his death? On speaking with the dazed and confused Nancy Faraday, a young woman who wakes in the farm-house near the barn laying in her own blood, DI Jackman soon realises that all is not as it appears. Nancy’s memories of the evening are foggy at best, and with her boyfriend, Evan, missing since the fire, things are not looking good. The real trouble begins when a masked man begins threatening Nancy, demanding debts which she cannot pay. Between anonymous notes, a hidden cannabis cultivation and a string of identity issues, Beneath the Ashes is tense, gripping and exciting. 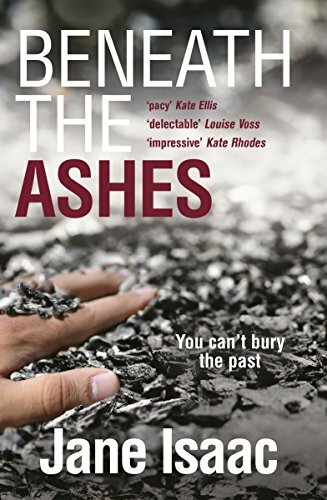 The author’s previous novels have topped the charts in both digital and paperback sales, and I’m sure Beneath the Ashes will be no different. The book will be released on November 1st, and is the perfect title to settle down to on a cold Winter’s evening. A must read for any fans of police procedurals and psychological thrillers. Order the book from Legend Press in paperback or ebook here. Jane Isaac’s forthcoming novel, and the third in the Will Jackman series, will also be released with Legend Press – pop back to my book reviews page for more on The Lies Within!